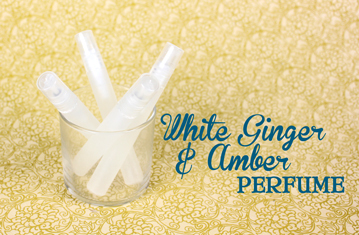 This month’s featured sample is White Ginger & Amber. Musky and deep with notes of spice and floral, this fragrance is great on its own and blends wonderfully with many fragrances! Nearly every order* shipped out in the month of June will have a little 1/2 sample bottle included. 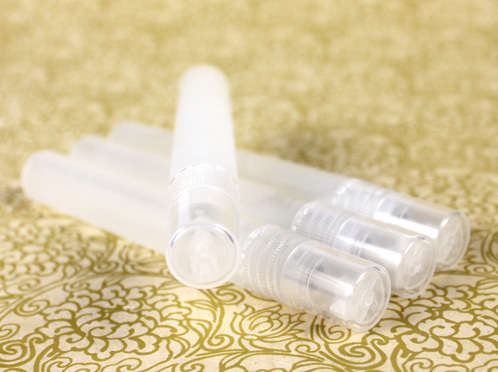 It’s the perfect size for making these sweet mini-perfumes! Step 1: Wash and sanitize your mixing container and funnel. 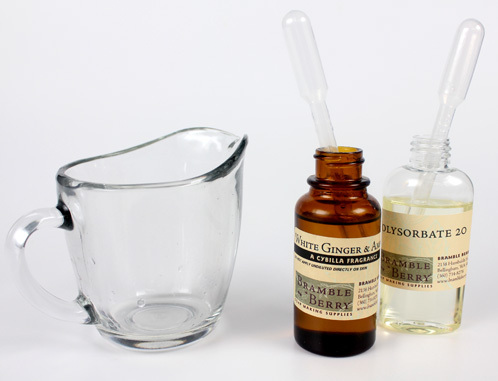 Step 2: In your sanitized mixing container, add 4 mL of Polysorbate 20 and 2 mL of White Ginger & Amber. Step 3: Next add 16mL 91% Isopropyl Alcohol, followed by 18mL of distilled water. It is important to use distilled water because tap or regular bottled water may contain trace minerals and other additives your town or city may add to the water. Along with the aforementioned, there is a chance for bacteria to be introduced, and that is never a good thing when it comes to beautification! NOTE ABOUT PRESERVATIVES: We didn’t use a preservative because of the alcohol content. But, you could add in a preservative to be extra safe. We suggest adding a water soluble preservative (such as Optiphen ND) in at around 1% of your recipe. Click here to read more about preservatives. Step 4: Once all of your ingredients are in the same container, the mixture may be cloudy. Give it a stir and it will clear. Step 5: Using a funnel or your super steady hand, pour the perfume mixture into the pen sprayer. Step 6: Label and share! Can’t get enough White Ginger and Amber? Here are some great blending ideas! Check out our previous sample pages: Cherry Blossom, Fresh Bamboo, Sweet Meyer Lemon and Violet. What are your favorite projects to make using your Bramble Berry free sample? *We include a 1/2 ounce fragrance oil sample with every order we can safely send a glass bottle in. Be sure to check your packaging well, the expanding foam can nearly swallow up those little bottles. When you say parts you mean drops or ounces. I want to try for the first time blending but i dont want to make more then 5ml. just in case is not right. Is vodka, everclear or ethanol a good substitution for rubbing alcohol? Most recipes I came across call for odorless vodka or everclear 190 proof or higher. Should you use a preservative in the recipe since it contains water or no? Thanks! I have just mixed up my third batch of this (I love it! ), but this time it remains cloudy no matter how much I stir. Should I discard it, or is it still ok to use? Good to know. Thanks for the quick response! Oh, wow! I didn’t see this page right away, and as soon as I smelled my sample, I thought it would make a great perfume. As soon as I can afford to, I want to get the ingredients. The White Ginger & Amber FO just smells so good! I love getting samples with my order. Makes opening the package a little like Christmas! 🙂 I love companies like Bramble Berry who have great customer service, and are willing to go the extra mile. I am definitely recommending you all to my fellow crafters!! You are so sweet Malinda, thank you so much! We are so glad to hear that you like the White Ginger & Amber Fragrance Oil as much as we do. If you receive a package this month, you should receive the Buttercream and Snickerdoodle FO and we already have a tutorial up for that, you should check it out! Thank you very much for sharing the recipe! Is this a recipe that can be used for personal use only or can it be used for retail? That sounds cool! What other FO would you recommend to try as a perfume other than White Ginger and Amber? You could use any other fragrance oil as they could and would all work as long as they are skin safe. Thanks @sisi and @cortney! I will try my hands in experimenting! Can’t wait to see how yours turns out Ksenija! You should dream up a 100% natural recipe for us trying to avoid alcohol and trying to remain all natural. Would you be able yo simply combine jojoba oil and a small small amount of EO? Definitely! Keep it at 90% Jojoba Oil and 5-10% EO and you should be good. Polysorbate 80 will still be great for perfumes. Just experiment with the usage rates like we did and see what you like! Polysorbate 80 is commonly used as a co-emulsifier in lotions and in self-emulsifying sugar or salt scrubs. Polysorbate 20 is most often used to mix your essential or fragrance oils into body sprays without separating. Just checking – Why does this recipe say 4 ML Polysorbate and 2 ML fragrance when the Polysorbate instructions say we should use equal parts? Thanks. We experimented with many different usage rates and this was the winning recipe. The combination of the fragrance oil and water just needed more Polysorbate to make a super stable emulsion. Hi AM I have one question. I am ordering from BB regularly,but I cannot order any chemicals like Polysorbate 20 or Witch Hazel because of the custom regulations here in the Netherlands. I found here Polysorbate 80 but I am not sure that I can just substitute it in this kind of recipes. Can you tell me what is the difference and can I still use the PS 80 if I add something to it? Thanks! You can absolutely use Polysorbate 80 in this recipe, as it is a great substitution if you are unable to get Polysorbate 20. Polysorbate 80 is commonly used as a co-emulsifier in lotions and in self-emulsifying sugar or salt scrubs. Polysorbate 20 is most often used to mix your essential or fragrance oils into body sprays without separating. All you need to do is just experiment with the usage rates like we did and see what you like! With your order can you request a 1/2 oz sample of any fragrance oil or can you only get a sample of the featured fragrance of the month? Also, about how many mls are in a lb of polysorbate 20? Thanks! 3 ml of Polysorbate20 weighs roughly .2 ounces. You can definitely request a sample on your next order. Just write us a note in the “notes” section of your order letting us know what you would like to try and we’ll do our best!